If you want to save money by canceling your cable subscription without giving up Fox News, you’re in the right place. 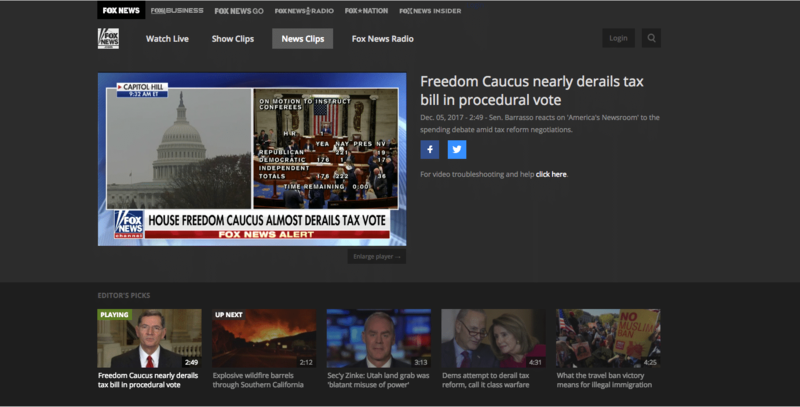 In this comprehensive guide, we’ll examine the options that cord-cutters have for streaming cable news and show you how to watch Fox News without cable. If you’re interested in watching Fox News without cable, your options are mostly limited to what are known as “skinny bundles” – streaming services that offer a selection of cable channels for a monthly fee, with no contract. Here’s a look at your best options. fuboTV first began as a streaming service that focused on soccer coverage, but has expanded into a fully-fledged cable TV alternative. Though you will still find quite a few soccer channels like NBC Sports and beIN Sports, fuboTV also provides you with access to a live stream of Fox News. The baseline fuboTV package costs $39.99/month, but you can get your first 2 months for $19.99/month. In total, you’ll get 75 channels. This includes Fox News and Fox Business, as well as MSNBC and Fusion. You can add further channels with additional subscription packages such as fubo Latino and fubo Sports Plus, but these don’t include any other cable news channels. One advantage that fuboTV has over DirecTV Now is that it includes a free, cloud-based DVR. You can record up to 10 shows or 30 hours of content – whatever comes first – and your recordings will be available until you choose to overwrite them with new content. This makes it easy to record Fox News programs like Fox & Friends for later viewing. fuboTV, like DirecTV Now, only allows you to stream on 2 devices at once. Again, this may pose a problem for you if you plan on sharing your account with any family or friends. As expected, fuboTV supports most modern TV platforms. You can use fuboTV on iOS/Android devices and Chromecast, as well as some Android TV devices. Other supported platforms include Apple TV, Roku, and Amazon Fire devices. There is no support for modern gaming consoles. If you’re only really interested in Fox News and cable news coverage, fuboTV is definitely not the right choice for you. While fuboTV does offer quite a few channels, cable news coverage pales in comparison to services like DirecTV Now or PlayStation Vue. For $39.99/month, it’s not really worth it. However, if you are a sports fan, you will get great coverage from channels like NBA TV and major soccer networks, as well as Fox Sports. To find out if you like fuboTV, you can get started with a 7-day trial. DirecTV Now offers Fox News as part of their $35/month “Live A Little” package, as well as all of their more pricey, all-inclusive cable channel offerings. If you’re looking for an inexpensive way to get Fox News alongside other cable news channels like Bloomberg, Fox Business, C-SPAN, Telemundo, and CNN, DirecTV Now is a very solid choice. You get a total of 10 news channels, and a total of 60+ cable channels, depending on where you live. However, DirecTV is not a perfect choice for watching Fox News without cable. There are a couple of reasons for this. The main problem with DirecTV is that there is no DVR support of any kind. That’s a big deal, because it means you’ll only be able to watch Fox News Programming like Morning Joe live – and not everyone can do that. While there is a DVR beta program ongoing, and DirecTV claims to be releasing a free DVR service in 2018, this is still a major caveat if you’re thinking about streaming Fox News on DirecTV Now. DirecTV Now is also quite stingy when it comes to simultaneous streaming. It only allows you to stream on 2 devices simultaneously, so larger families are going to have a hard time watching the programming they are interested in. DirecTV Now also doesn’t have the best device support, and has an inconsistent experience across different platforms. You will find support for common devices like Chromecast, Roku, Apple TV, and Amazon Fire TV, as well as all modern iOS/Android devices. However, you won’t be able to use DirecTV Now on smart TVs, or on any gaming consoles like the Xbox or PlayStation. DirecTV Now is actually a great choice for AT&T customers – despite the abovementioned drawbacks. This is because AT&T owns DirecTV, and offers DirecTV Now as an add-on for AT&T Unlimited customers for just $20/month. If you are an AT&T Unlimited customer, this is by far the cheapest way to watch Fox News without cable. If you’re on the fence about whether or not to try this service you can get DirecTV Now with a 7-day free trial. PlayStation Vue offers channel bundles ranging from the $39.99 “Access” package with 40+ channels, to the $74.99 “Ultra” package which has 88 channels including HBO and Showtime. You can get Fox News with the basic $39.99 package, so it’s the same price as Hulu With Live TV and fuboTV. You don’t just get Fox News, either. You can enjoy a wide variety of news coverage from other stations like HLN, Fox Business, BBC America, CNBC, MSNBC, and CNN. You don’t get quite as many news stations as you would with DirecTV Now, but there are two huge benefits to choosing PlayStation Vue if you’re interested in streaming Fox News without cable. The first benefit is a great DVR service that does not cost an additional fee. Included with your base, $39.99 package is an unlimited cloud-based DVR. You can record as many shows as you want for up to 28 days. But the biggest reason to choose PlayStation Vue is their industry-leading simultaneous device streaming policy. You can stream PlayStation Vue content on up to 5 devices at once – which puts this service at the top of our list for larger families. Platform support for PlayStation Vue is also great, and every PlayStation Vue app delivers a consistent and high-quality streaming experience. Supported devices include Roku, Apple TV, Chromecast, and Amazon Fire TV. You can also stream on all modern iOS and Android devices, as well as PlayStation 3/4 consoles. Notably, Xbox support is absent, which isn’t a surprise given Sony’s position as a Microsoft rival. If you are willing to accept slightly fewer cable news channels in exchange for a great DVR and incredible simultaneous device streaming capabilities, PlayStation Vue won’t disappoint. If you’re interested, you can try the service out with a 5 day free trial. Hulu With Live TV is still in beta, but is becoming a very popular choice for cord-cutters. This is because, for $39.99/month, you get access to 55+ channels, archived video content, and unrestricted access to the entire library of Hulu VOD content. For those of you who already have a Hulu subscription, Hulu With Live TV should be at the top of your list for watching Fox News without cable. You’ll get a nice selection of news channels with your subscription, including Fox News and Fox Business, as well as MSNBC, CNBC, HLN, CNN and CNN International, and ESPNEWS. Like competitors Sling TV and DirecTV Now, Hulu’s basic subscription restricts simultaneous device playback to 2 streams at once. However, you can pay $14.99/month to unlock the Unlimited Streams package. With this package, you can stream on 3 devices outside your home, and on unlimited devices within your home Wi-Fi network. Hulu’s DVR is better than both fuboTV and PlayStation Vue (and DirecTV Now, since the service doesn’t offer a DVR). You can record 50 hours of content without any time limits or restrictions. You can also pay $14.99/month for the Enhanced DVR package, which expands your storage to 200 hours. If desired, you can combine both the Unlimited Screens and Enhanced DVR package for a $19.99/monthly fee. Hulu With Live TV has okay platform support, given that it’s still in beta. You can use it on iOS and Android devices, web browsers, Xbox consoles, the 4-gen Apple TV, and Amazon Fire devices. Support for other platforms like Roku is expected to be added in the future. Hulu With Live TV is a very good choice for watching Fox News without cable. The DVR is great, you get plenty of cable news coverage, and you get access to all of the critically-acclaimed on-demand video content that Hulu has created, such as The Handmaid’s Tale. Hulu With Live TV, like most other streaming services, offers a week-long free trial, so you can give it a shot and see if you like it. While YouTube TV has been around for more than a year, it was previously restricted to only a few geographic locations. Now, though, it’s expanding rapidly and offers cord-cutters a great way to watch Fox News without cable. For a flat fee of $35/month, you get 40+ channels. This includes Fox News and Fox Business, as well as other channels like CNBC, MSNBC, Newsy, BBC America, BBC World, and ESPNEWS. YouTube TV costs the same per month as DirecTV and has fewer total news channels. However, there are a couple reasons that YouTube TV is a much better choice, if it’s available in your area. First, YouTube TV has the best DVR in the industry – bar none. You get truly unlimited storage in the cloud for 9 months. There are also no limits on how many TV shows you can record simultaneously. YouTube TV also lets you stream on up to 3 devices at once, which is more than DirecTV, fuboTV, and Hulu With Live TV (without the Unlimited Screens package). PlayStation VUE offers 5 device streaming, but is more expensive and has fewer total news channels. The only real drawback of YouTube TV is that platform support is quite limited. You can use web browsers, iOS/Android devices, and Chromecast/Google Cast devices to stream YouTube TV, as well as select Android TV platforms. That’s it – no gaming consoles, Amazon Fire TV, Roku, or Apple TV support, to name a few. Given the good package of channels you get for $35/month, as well as a great simultaneous streaming policy and the best DVR in the business, YouTube TV offers a lot for your money. It’s a great choice if it’s available in your region, and you can give it a try for a week. There is no free trial, unfortunately – you’ll have to fork over your first $35 payment to see if you like it. YouTube TV and DirecTV Now tie for this title, at $35/month. If YouTube TV is available in your area, we recommend it over DirecTV Now, due to its better DVR and simultaneous streaming policies. However, if you do have an AT&T Unlimited plan, DirecTV Now will only cost you $20, so it’s probably a better choice. We’ve got to give this to YouTube TV. The fantastic DVR, incredible package of channels and $35 cost make it too good to pass up. But if you can’t get YouTube TV in your area, Hulu With Live TV is a viable alternative. You’ll get Fox News and a variety of other channels, as well as unfettered access to the entire Hulu VOD library. Finally, if you have a large family, PlayStation Vue is probably a better choice than both of these. The 5-device streaming limit is an incredible value, even though you’ll miss out on a cable news channel or two.